Today was a travel day as I moved from Kyoto to Osaka, but I still managed to get quite a bit done. I have to say that having a rail pass makes things pretty easy to get from place to place - you simply show your pass to the attendant at the turnstiles and that's it, except for trains with reserved seating where they need to print you a ticket. If you are going to be in Japan it's worth checking them out, and even if you don't need the universal pass there are several others that are reduced in both scope and price. Once I got to my hotel I dropped off my bags and decided to check out Osaka-jo. Although it's pretty close, it still took a while since the castle grounds are pretty huge so the walk is loooong. Still, it's a pretty sight and the museum inside has some neat stuff too (although it's a bit repetitive; I think I now know just about everything regarding Hideyori Toyotomi, his extended family, and all the battles at Osaka-jo). If you go, get the English audio guide. It's free and a lot faster than reading the text provided, which isn't as extensive as the guide anyway. By the time I got done with that, the sun was setting and I was hungry. Luckily there were plenty of takoyaki stalls so I had a pretty yummy snack! Oh octopus, how delicious you are even without the sauce toppings (apparently they only provide seaweed topping in Osaka, but I think the insides are saucier than the kind I'm used to). After that I thought I should go check out the giant ferris wheel in downtown Osaka. But first, dinner at Matsuya, mostly because I wanted something quick, familiar, and cheap. Is it me or have the sizes increased since I was last here in 2005? For 390 yen I got a large bowl of salad, miso soup, gyudon, and an egg. It seemed to me there was much more rice than I used to get, but maybe that's because I used to eat at Yoshinoya more than Matsuya, or my memory is just faulty. Anyway, pretty decent dinner. On to the ferris wheel! I have to admit, it was a little kowai yo1, but mostly since I went through many earthquakes when I lived in Tokyo and of course the image of swaying buildings was prominent in my head the whole time). The view was really quite excellent however, and it was a pretty enjoyable ride for 500 yen. They could up the scariness a little more by putting a pause in at the top. Back to the hotel to relax for the rest of the evening. So far, I'm really liking this place - at about $40/night, it's extremely cheap, but the room is also decently sized (for Japan), there is free breakfast included, and it is very centrally located. It also has free internet, which of course I love. The one problem when I got here, however, was that no one explained that there is a trick to lighting your room. When I first opened the door, the room was dark, but I managed to feel some light switches on the wall. When I flipped them though, nothing happened! I found another one but it wasn't immediately obvious what to do, it just says 'in'. Since it was dark I couldn't see anything and ended up using my netbook as a flashlight (although it turns out they provide one of those under the desk). 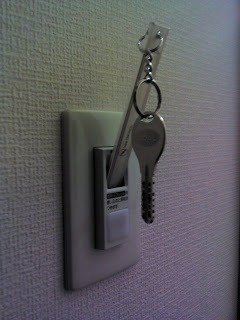 Eventually I figured out that you have to insert your key in the 'in' hole, and the lights then turn on. Pretty tricky! Sums up my feelings on stairs today. 1. Kowai yo = very scary. Incidentally, the ferris wheel isn't the only thing scary about that area. It was a little tricky finding the ferris wheel entrance and I ended up at Joyopolis by mistake. When I saw the sign for 'live dolls', I got out of there fast!